MRTC is working with other trail agencies and communities to see further development of the rail-trail into Preston County, WV to the east, Marion County, WV to the south, and Fayette County, PA to the north. The opportunities to extend or link to other rail-trails are a challenging undertaking that often involves private property negotiations, corridor purchase, and/ or easement agreements. While some connections are solely proposed and have no planning or negotiations taking place, others have been over 15 years in the works with new trail construction immanent. A proposed trail that would continue the Mon River Rail-Trail along the Monongahela River and ultimately link to Palentine Park in Fairmont, WV. This project would require several easements through private property. The trail has been mapped and conversations have begun with property owners. The IHTC envisions a network of trails that stretch from the shores of Lake Erie to the confluence of Three Rivers in Pittsburgh and on to the Ohio River in the Appalachian foothills of West Virginia. 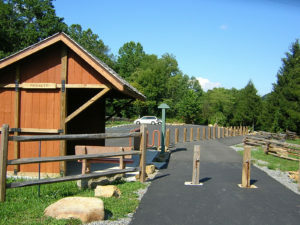 The Mon River Rail-Trail is part of the Parkersburg to Pittsburgh Trail corridor that would connect the North Bend Rail-Trail, West Fork River Trail, Sheepskin Trail, and the Great Allegheny Passage.